Preheat oven to 350. Line 2 baking sheets with parchment paper. Set aside. Beat cream cheese and butter with a mixer until smooth. Add sugar, and continue to beat until fluffy and well incorporated. Add egg and vanilla paste, and beat until incorporated. Stream in dry ingredients, and mix until combined. Scoop tablespoons of dough and roll in your hands to form into balls, and place on parchment-lined baking sheets, about 2 inches apart. If the dough is very sticky, refrigerate it 10-15 minutes prior to rolling into balls. Bake until cookies are puffy, about 10 minutes. Meanwhile, heat the guava paste in a small pot with water, stirring occasionally until the guava paste is of preserves-consistency and smooth. This should take about 10 minutes. Keep on very low heat until the filling of the cookies is completely finished. Remove from oven, and make indentations in centers by pressing with your thumb or use the back of a spoon. Fill with guava. Return to oven, and bake an additional 5-8 minutes or until golden brown. Transfer the cookies on the parchment paper sheets to wire racks, and let cool completely. I had some leftover guava paste (easily found in the "Latin" or "International" section of the grocery store either in plastic or in a tin) that I had served with cheese for one of our "snackies" dinners and didn't know what to do with it. It is super tasty also very thick and sticky so it wasn't like I was just going to spread it on bread and call it a day. Guava paste and cheese is a classic combination and one of my favorite uses of it, pastelitos, combines cream cheese and guava paste in a flaky turnover. So good but a little fussy and trickier to pack for lunches which was one of my goals. 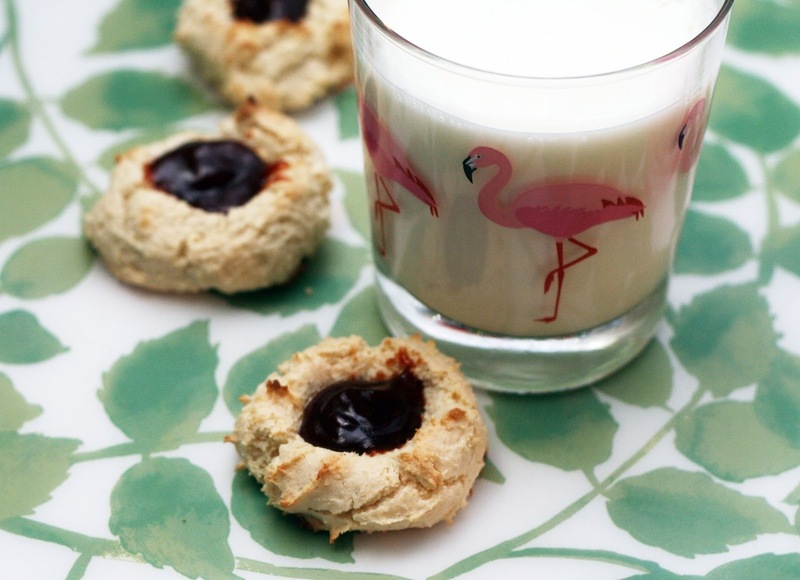 So I took that idea and transformed it into these easy, very portable thumbprint cookies. The cookie is very tender (and slightly craggy) thanks to the cream cheese. The guava paste took forever to melt (okay, like 10 minutes) but when it did, it was the perfect consistency for spooning into the cookies. Pro-tip: the guava paste is basically molten sugar at this point so use two spoons (one to scoop and one to scrape the guava goo off the other spoon) to fill the cookies if it doesn't drip off the spoon easily--I had to do this for the second batch because even on low, the paste started to thicken up again. The end result is a not-too sweet cookie that is full of juicy guava flavor and mellow cream cheese cookie.